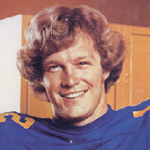 Joe Roth (May 29, 1955 – February 19, 1977) was a college football player, an All-American quarterback at the University of California, Berkeley. Roth played the 1976 season with melanoma and died 3 months after his last regular season game (and just weeks after an all-star game in Japan), in February 1977. Later that year, Roth’s number 12 jersey was retired, the only number currently retired by the Cal Football program. A 1973 graduate of Granite Hills High School in San Diego, Roth led Grossmont College of El Cajon to an undefeated season and state title in 1974, and transferred to University of California, Berkeley in 1975. Originally a back-up, he won the starting role in the fourth game of the 1975 season, and led the California Golden Bears to the Pac-8 title as co-champions. The 1975 team had such stars as running back Chuck Muncie and wide receiver Wesley Walker. Cal led the nation in total offense, remarkably gaining the same yardage both passing and rushing with 2,522 yards respectively. In 1976, Roth was a pre-season favorite for the Heisman Trophy. The season was more tumultuous, and towards the end of the year Joe’s performance started to drop, but he was named an All-American and would finish ninth in the Heisman Trophy voting, won by Tony Dorsett. After the season ended, he revealed that he had played the last half of the season with melanoma, the recurrence of a previously removed tumor. Despite his deteriorating physical condition, he honored his commitments to play in both the Hula Bowl and the Japan Bowl. During the Japan Bowl festivities, according to a friend of his, Roth agreed to sit for a thirty-minute autograph session. But at the end of the agreed upon half-hour, there were hundreds of smiling Japanese kids still waiting. So he sat patiently and signed autograph after autograph until there were no more kids in line. Then he went outside, fell to his knees, and threw up in the bushes. He died shortly thereafter in his Berkeley apartment on February 19, 1977 at the age of 21. Posthumously, Roth received the Berkeley Citation, which is awarded to a wide range of distinguished people, academic or nonacademic, whose attainments significantly exceed the standards for advancement in their fields and whose contributions to the university are manifestly “above and beyond the call of duty.” He was also inducted into the University of California Athletic Hall of Fame. Several awards are named in honor of Roth, including the Joe Roth Award for the high school player in the San Diego area that best demonstrates courage, the Joe Roth Memorial Award which is given to the San Diego County junior college football player that best exemplifies high academic standards and athletic excellence, and the Joe Roth Award which is given to the Cal football player who best demonstrates courage, attitude & sportsmanship. Berkeley designates each year’s home game against either USC or UCLA as the Joe Roth Memorial Game.